When it comes to things to do in Scotland, I think of history, Scotch, and afternoon tea with shortbread. I also imagine kilts, haggis, and the sound of bagpipes. But, as with every country I visit, I discover there’s so much more than the stereotype. I didn’t expect the genuine friendliness of every cab driver I met (seriously, they’re all like tour guides) and the amount of gourmet foods available (more on that later). But, it was really these seven things that I think surprised me the most. Now, I thought Scotland was all about whiskey (and trust me, they still are), but I didn’t think they’d be just as serious about gin. I found multiple types of gin and gin cocktails on every menu. But the most omigawd-I-have-to-do-that moment was when I discovered Edinburgh Gin. They make some fabulous gin and they also offer a gin distilling experience where you can make your own. Located in a cavernous brick basement accented with copper finishings and vintage furniture, you sort of feel like you’re sneaking around in a speakeasy distilling your own alcohol. There’s over two dozen different herbs and spices to choose from, so you can get creative with your recipe. The best part, though, is that you get to name it, label it, and bring home your very own hand crafted bottle of gin. 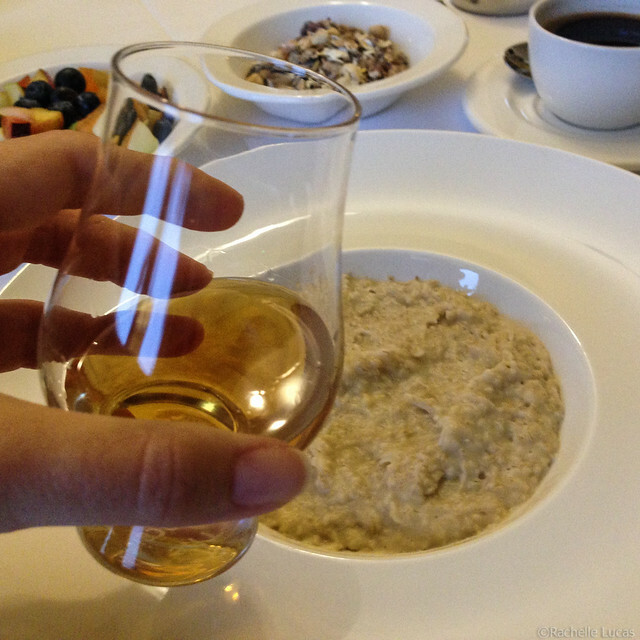 When I saw this on the room service menu at Cromlix House, I had to order it — a dram of whisky and oatmeal for breakfast. Why not? If you’re staying overnight in a country estate, you might as well go all-the-way with the full I-want-to-feel-like-Lady-Crawley experience. (For those of you that don’t know, that’s the feisty heiress on the show, Downton Abby. And, yeah, I’m a huge fan.) Surprisingly, I liked it. It makes the oatmeal kind of spicy and warms you up faster than a plain ole bowl of cereal ever could. When I first heard about this, I didn’t quite believe it. 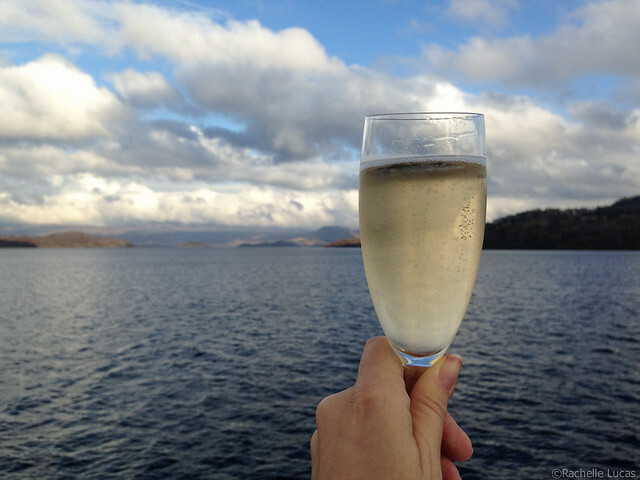 A champagne cruise? In Scotland? Yup! Now, of course I had heard about Loch Ness (who hasn’t? ), but I didn’t realize “lochs” were “lakes” and that Scotland has tons of them. Probably just as many (if not more) than the amount of lakes in my home state of Florida. And I’ll be dang, we had a perfect blue-sky day and sipped champagne on a yacht in the middle of a beautiful lake where a few of Great Britain’s celebrities live. I promised not to name the celebrities, but I can tell you the lake! It’s Loch Lomond. I’ve been running long distances since college and have a few marathons and half marathons under my belt with the medals hanging in my office to prove it. But hiking is my new thing and Scotland has some pretty epic ones. 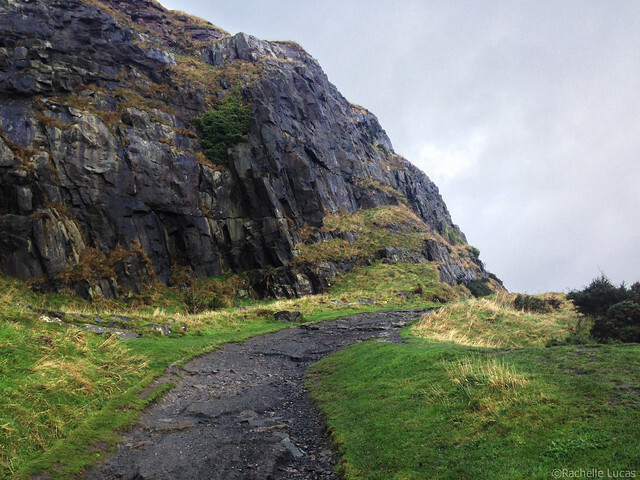 While staying in Edinburgh, I went for a short hike in Holyrood Park around Arthur’s Seat, a dormant volcano. I couldn’t believe it was so close to the city and just a 15 minute walk from where I was staying at The Balmoral. Now I’ve got a couple of other hikes on my to-do list. One is to hike to Britain’s most remote pub, there’s no roads to it so you have to trek 18 miles over Munros to get to it. Talk about earning a pint of beer! The other hike I want to do is inspired by my friend Jim with Macbeth Photo. He and his buddy, Phil, walked coast-to-coast across the UK (how cool is it to be able to say that?) along Hadrian’s Wall. The 84 mile walk can be covered in about 6-8 days, which is much more feasible and less time consuming to me than spending a month along Spain’s Camino de Santiago. Plus, there’s cozy pubs and inns along Hadrian’s Wall where you can stop and rest. If hiking isn’t your thing, you can always cover some ground in a Land Rover and go on a Highland Safari. This was something I thought I’d only do in South Africa and was quite surprised to find it available in Scotland. The only thing more fun than a road trip, is going off road and seeing what these vehicles are capable of. 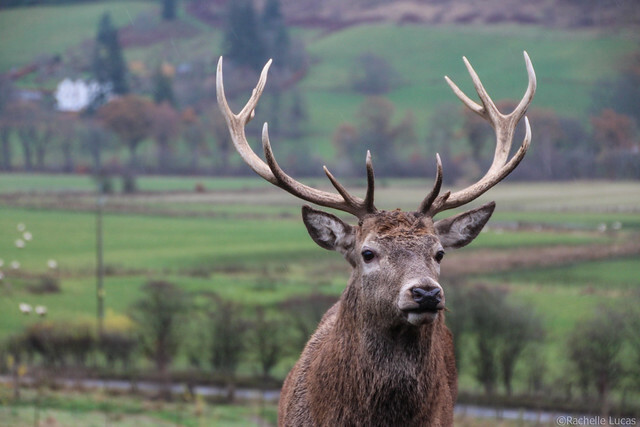 You’ll also get to see some pretty remote landscapes and may even spot one of Scotland’s Red Deer. 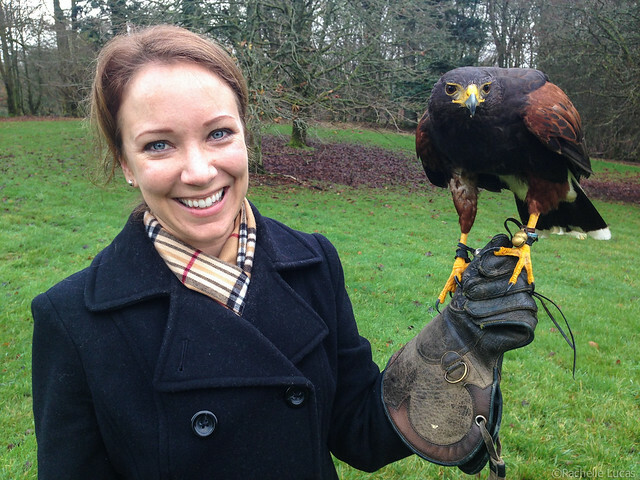 While staying at the Cromlix House, I had the opportunity to take a one-on-one falconry lesson and spend some time with two very majestic birds. Not only am I absolutely in awe of the speed and skill with which they fly (one flew underneath my arm as I rested my hand on my hip), I’m also amused by how many phrases we use today that originated from this sport. For instance, the term “fed up” comes from when a bird has had enough to eat and doesn’t want to play anymore. I learned so much that morning and it’s truly one of my favorite memories from Scotland. I would never have thought that a bathing suit would have been one of my “must pack” tips for visiting Scotland, but it is. I have to give it to the Scots, they really know how to spa. 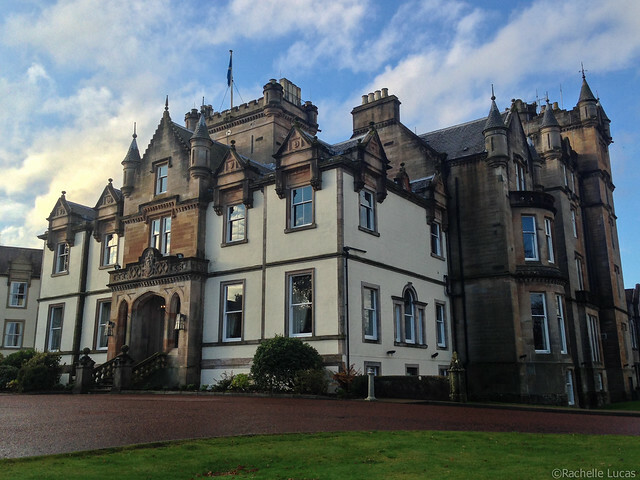 The two that I visited (one at Cameron House and one at The Scotsman) where so big you could spend a whole day there and not experience everything. There were steamy indoor swimming pools, and whirlpools, and a sauna, a steam room, and experience showers. There was also tranquil relaxation rooms and gourmet teas and snacks. I guess when the weather is chilly (or even when it’s warm), the Scots practically live at the spa. This post was created as part of my collaboration with Visit Britain. As always, all of the opinions, thoughts, and enthusiasm for travel and food are entirely my own.